That's right, Magic's Kingdom and Kelly's Heroes — each a groan-inducing pun in its own right — were combined on one card. Kelly has a tank; Magic gets a star, hearkening to his time on the "showtime" Los Angeles Lakers. Kelly's teeth are front and center; Magic gives collectors the thumbs-up. The writing on the card's back is as putrid as what's on the front. 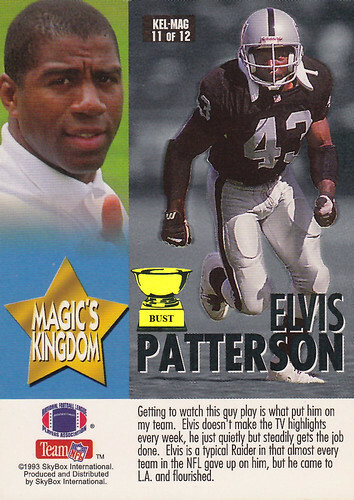 Magic all but admits he chose Elvis Patterson only because he watched him play more than other players. Who cares if he's not good, right? Which brings up the most important failure of the subset: Why in god's good name should football fans care what a basketball player thinks of the NFL? 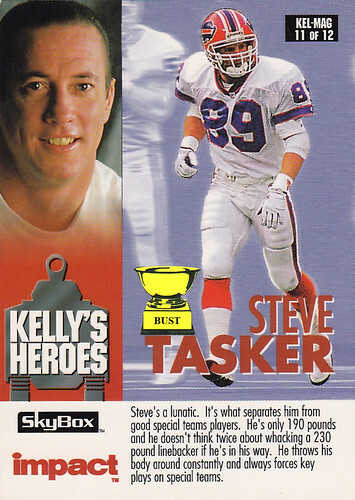 Nothing heroic, nothing magical for this thinking outside the Skybox.